For some reason I cringe every time I throw a jar or plastic container away. I feel a very strong urge to hoard it. Many times I do. My cupboard is filled with empty sauce jars, cans, sour cream containers, and the like. You never know when you are going to need one to make a Queen of Hearts crown or vase, or glittered centerpiece. Am I right? 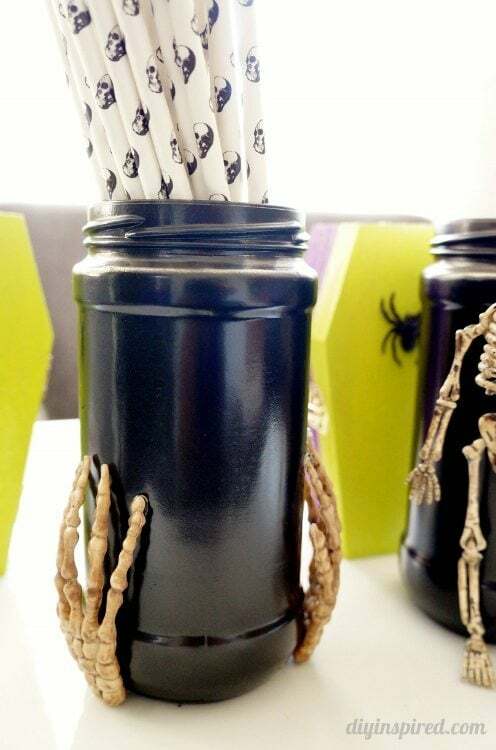 Anyway, with Halloween coming up, I couldn’t resist making these spooky Halloween recycled jars. 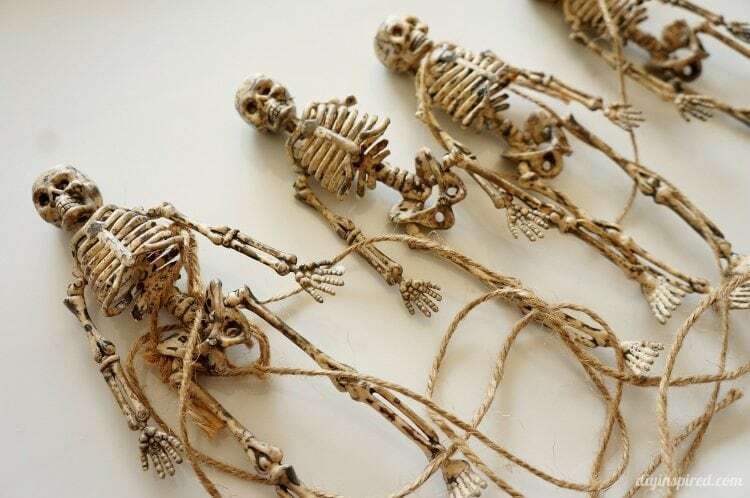 You can make them in a jiffy and they are very inexpensive. First wash and clean your recycled jars. Make sure they are completely dry. 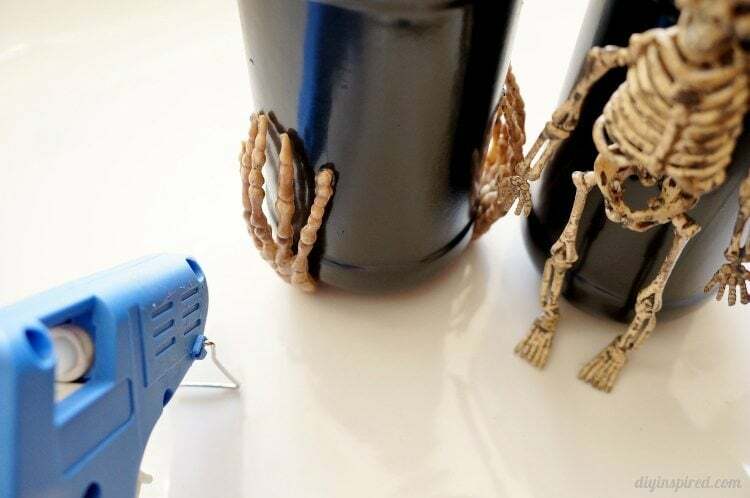 Spray paint them in a well-ventilated area. I used three very light coats, allowing 15 minutes of drying time in between coats. 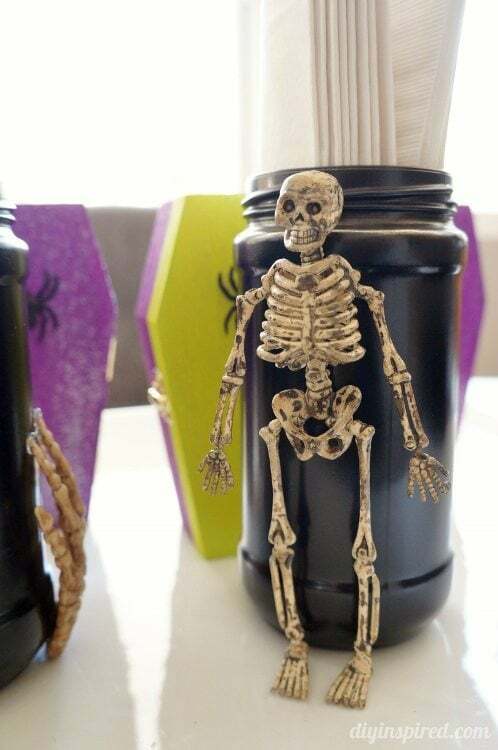 I found these bones and small skeletons at Michael’s Craft Store. 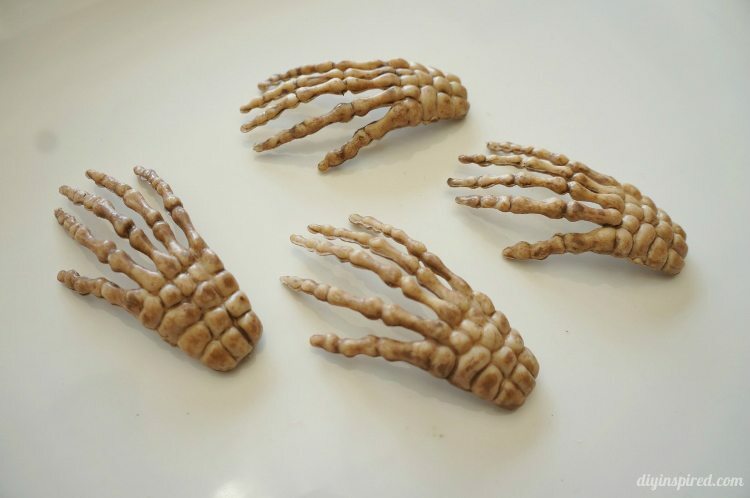 You can use them for many things life a driver for a spooky stagecoach or display them in apothecary jars. 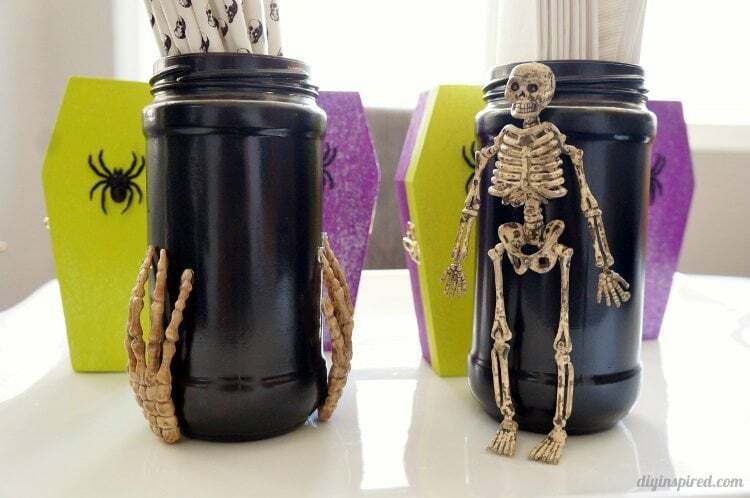 Play around to see where you would like to position your bones and skeleton and take note of what areas touch the jar. 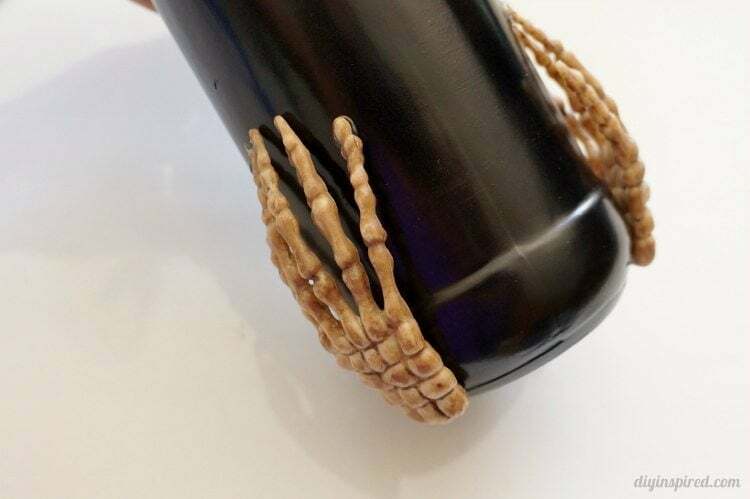 Place hot glue on those places and adhere. 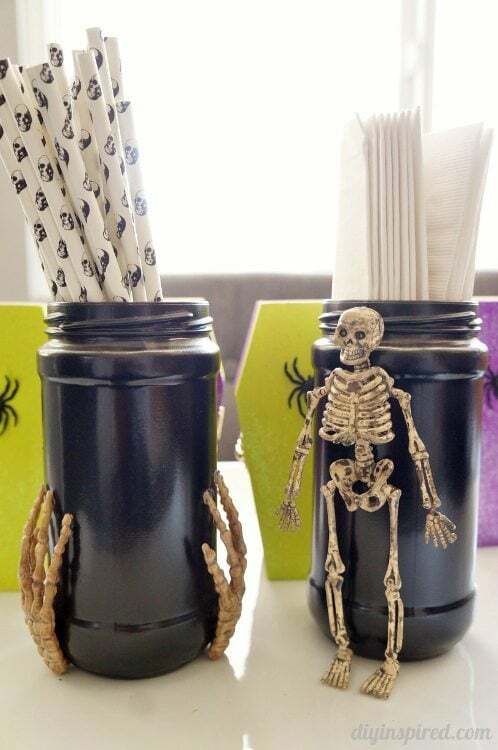 You can use them as straw and napkin holders for a Halloween party or put a bouquet of white flowers in them and place plastic spiders on top. What a creative way to recycle plastic containers! I love this. 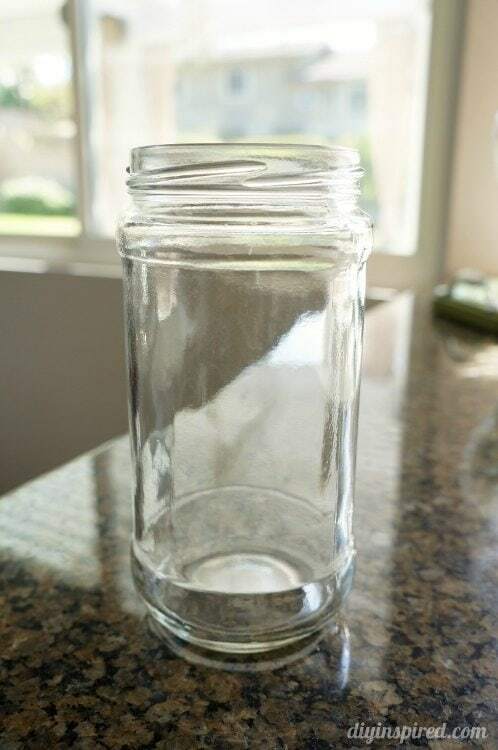 I hoard way too many glass jars too, and this would be such a great way to use them! Love it! I’m a big jar hoarder too! Thank you, Carin! Lovely idea! My girls will like these jars very much. They did some recycling projects at school recently and they’ll definitely approve some more recycling. Thank you for sharing! Greets! So glad you like them, Dona! I hope you and your girls try it out!